Jeff Suchland once raised cattle on his rolling land near Missouri's Cuivre River. Cows were good, but he wanted to work "more gently with the ground." Enter the Alpaca (Vicugna pacos), a small herding relative of camels, native to South America's Andes mountains. Exit the cows. Jeff's enterprise is now Alpacas of Troy. Unlike their load-bearing larger cousins, llamas, alpacas are bred to produce fiber. The "blankets" of alpaca hair Jeff shears each spring yield exquisitely fine, warm, soft fiber prized by spinners and knitters. If you have to shun wool's scratchy feeling, prepare your skin for pleasure when you feel Alpaca. 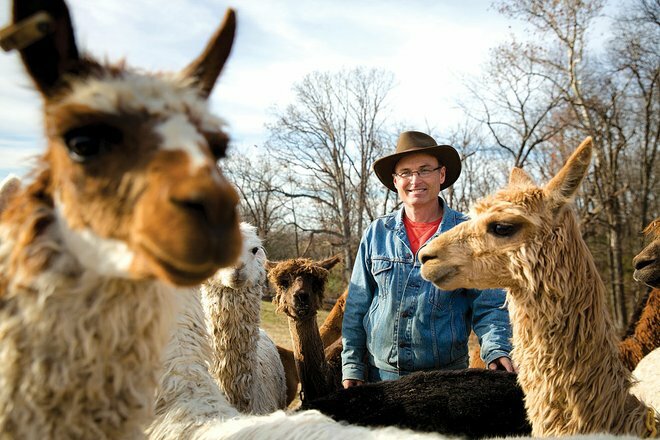 Raising alpacas is an artisan kind of farming, that Jeff Suchland believes is a growth niche. He enthusiastically teaches that his can be a viable livelihood for others too, especially when raising the animals gets combined with milling, those first processes of working with alpaca fiber. Jeff is a passionate advocate for fiber farming with alpacas. He offers farm tours (by reservation), gives workshops in shearing, dying and more - and sells his farm's fiber goods at Farmers Markets, area-wide. Earthworms met Alpacas of Troy a the Maplewood Farmers Market, hosted each Wednesday at the Schlafly Bottleworks. The title of one of Jeff's workshops sums up his views: Raising Alpacas for Happiness: Harmonizing Management and Preparing to Profit.